Cormorant is a kind of large fish-catching bird with black furs. It has long neck and it can dive and stay under water for long time. It is searching the fish while it is under water. The bird then catches the fish in its beak and returns to the surface. 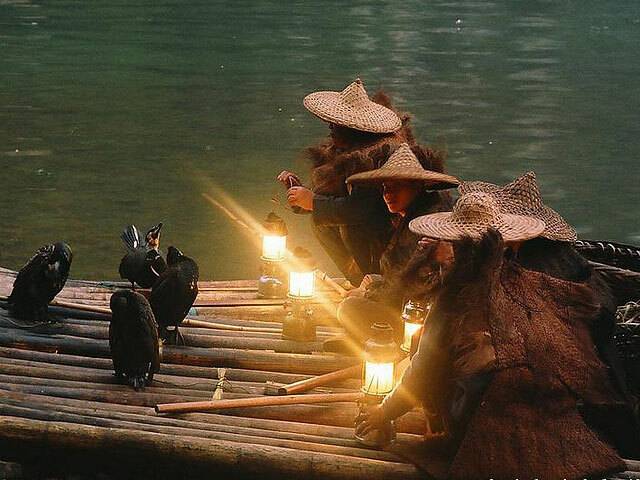 The fisherman in Guilin area started to use cormorants to make a living long time ago. Some of the fishermen are still doing the cormorant fishing now. When the bird is fishing for the fisherman, the bird is unable to swallow the fish as a string has been tied loosely around its neck. The fisherman who is standing on a bamboo raft will lift the bird onto the raft and remove the fish and drop it into a basket. The bird then goes back into the water and tries to catch more. Cormorant fishing is always available in the city of Guilin and Yangshuo in the evening. For those who are interested in this fishing and want to know the local fisherman's life, it is quite worthwhile. But we recommend the fishing in Yangshuo, not in the city of Guilin. And normally the cormorant fishing happens only in the evening as the fisherman will put an oil lamp in the front of the bamboo raft to attract the fish.